Place a hot-fix crystal in position on your project (glue side facing down). Slide applicator to the ''ON'' position. Press red button and hold down to activate the heating element. Wait approximately 30 seconds.Caution: Do not touch any metal parts. The applicator will get very hot. Holding the applicator vertically, continue to hold the red button down and lightly touch the top of the crystal. You do not need to use any pressure--just a gentle touch for about three seconds. The heat will radiate through the crystal and activate the glue on the hot-fix crystal. The embellishment will now be securely attached. Remove the applicator. Release the red button to allow applicator to cool. When you have completed your project, slide the black switch to the ''OFF'' position. This is a safety feature to prevent the applicator from heating even if the red button is held down. Note: To avoid burning your project, be especially careful when adhering crystals smaller than the head of the applicator. Not recommended for leather, water resistant material or non-porous surfaces. Before beginning any project, always test the hot-fix crystal in an inconspicuous area to make sure you are getting the best adhesion possible. 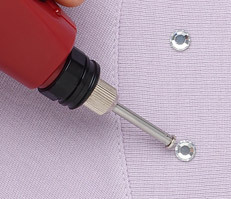 Tip: Hand-wash fabrics with embellishments.